The following is my bulletin column for Easter Sunday. When I was in seminary, often enough during Holy Week, some major controversy or another would inevitably arise. One spiritual director used to say that the seminary was a prime target for the Devil because if he undermines what happens there, he undermines the whole Church. Since then, I’ve always had a greater sense of how the Devil diligently works to destroy what is good and holy. At certain moments, he seems relentless in his efforts. I imagine that if there are books written about what are best practices for an Easter Sunday bulletin column, chapter one might be entitled “Don’t Mention the Devil,” but I’m going to charge ahead anyways. In many of his homilies thus far, Pope Francis has referred to the Devil and his attempts to steal from us our life and our joy in Christ. I figure it is never a bad thing for a priest to speak in union with the Pope! Many of you that I will greet this Easter morning, I know well, some not so much, and some who are reading this, I know not at all. I do know, however, that you were bought at a price. God loves you so much that He gave His Only-Begotten Son up to death for you. Whether you’ve been faithful to God, faithful to His Gospel, Faithful to His Church, and Faithful to the Sacraments or not, God loves you. He has paid the highest price for you. When we are weighed down by anguish and suffering, we might think that God has forgotten us. Illness, unemployment, family discord, betrayal, and hosts of other sufferings can perhaps make us feel discouraged. So too, our own sinfulness can convince us that we have no hope of ever living near to God. The Devil uses all of these things to separate us from God. He plants tares in our fields, hoping to discourage us in our Christian life. In a way, his intense effort to destroy us is itself a testimony to the extraordinary love that God has for us. If God did not love us so much, His Enemy would not be taking aim at us. Satan can unleash the powers of Hell against us, but he is victorious only if we permit him to overcome us. Psalm 27 tells us, “Though an army encamp against me, my heart does not fear; Though war be waged against me, even then do I trust.” Sometimes in life, we might stand on the city wall and see the devastation that surrounds us. Whether it be our own failures or, like the man who planted wheat in his field and discovers in the morning that an enemy has come during the night and sowed weeds among the wheat, we can be tempted to discouragement. In these moments, let us trust Jesus even more. Today, perhaps there are many people at Mass who, in one way or another, are perplexed by the situation in which they find themselves. Easter Sunday is for you. The announcement of Christ’s Resurrection is not only an announcement of a past event. It is an announcement of a present reality and of a future glory. Christ is defeating sin and death today. He has crushed the serpent’s head and has purchased you at a costly price. So, do not be discouraged. Even if tomorrow you should awake and discover that weeds have been sown among the wheat; even if tomorrow you should sin greatly; even if tomorrow you should experience the pains of illness, the loss of work, or the rupture of relationships; even if an army encamp against you and all out war be waged against you, do not yield to discouragement. Today, Easter Sunday, is the Day of Victory. It is the day of your victory. He has conquered sin and death. He died for you and He rose for you. You don’t have to wait for victory. It has already happened. Don’t let the Devil steal from you the victory that has already been won. To all who may feel distant from God, to all who feel weighed down by their past, to all who feel the assaults of the Evil One, to all who have awakened to discover that an enemy has sown weeds among your wheat, I wish you a Happy Easter because this New Day and the joy of victory belong to you. "And the people stood by watching" (Luke 23:35). This line in today's Gospel really struck me. 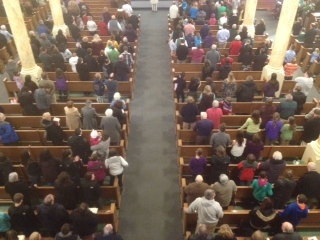 Today, our parish's 10:30 Mass was packed. It was a crowd. So often, we can live our Christian life as members of the crowd. We vacillate according to the way in which the wind is blowing. We think of ourselves as Catholic, but in that kind of remote, distant way. There's nothing overly personal about it. When we hear about the Catholic Church, we think about something extrinsic to ourselves. This is one of the great threats to the Christian life. When we simply get absorbed into the crowd, the Gospel loses its hold upon us. Compare this to what happened with Peter. Yes, he denied the Lord. He betrayed him by his cowardice. And St. Luke tells us that after the third denial, "The Lord turned and looked at Peter." Peter fell, but this did not end his relationship with the Lord. Jesus looked at Peter. He gazed upon him with the eyes of tenderness and mercy. This is what Jesus wants for all of us. He looks at us with love. We might be like Peter. Maybe we have denied and betrayed him many times. He still looks at us. Some may try to escape this gaze by blending in with the crowd. But, to disappear into the crowd is to lose the key to our life. True life is discovered in his merciful gaze. A gaze that is not dependent upon our own goodness. Jesus looked at Peter immediately after his betrayal. As a pastor, I want my churches filled with gigantic crowds this Holy Week. But, not the crowds of anonymity or the crowds who are easily persuaded. No, I want my parishes to be crowds that consist of individuals who know that they live every moment (even their failures) in the tender gaze of Christ. Jesus wants every person in the crowd to live in the awareness of this gaze. Let's not stand by and watch. Let's make it personal. Even if we are filled with failures, let's live in his tender gaze. "Jesus is God, but he humbled himself to walk with us. He is our friend, our brother. Here, he enlightens us on the journey. And so today we welcome Him And here the first word that comes to mind is “joy!” Do not be men and women of sadness: a Christian can never be sad! Never give way to discouragement! Ours is not a joy that comes from having many possessions, but from having encountered a Person: Jesus, from knowing that with him we are never alone, even at difficult moments, even when our life’s journey comes up against problems and obstacles that seem insurmountable, and there are so many of them! It is at this time that the enemy comes, the devil comes, often disguised as an angel who insidiously tells us his word. Do not listen to him! We follow Jesus! We accompany, we follow Jesus, but above all we know that he accompanies us and carries us on his shoulders. This is our joy, this is the hope that we must bring to this world of ours. Let us bring the joy of the faith to everyone! Let us not be robbed of hope! Let us not be robbed of hope! The hope that Jesus gives us!" "You Are My Son." This Alone We Keep. At the beginning of his public ministry, Jesus was baptized in the Jordan by John the Baptist. Immediately after that baptism, where Christ's sonship was proclaimed aloud by the Father, Jesus went out into the desert. There, he was tempted by the Devil who tried to undermine Jesus' confidence in his filial relationship with the Father. During these intense last days of Lent, this scenario is lived out again in the Church's liturgy. Yesterday, as the crowds picked up stones in order to kill Jesus, he escaped them and went across the Jordan to the place where John originally baptized. Jesus seems to be returning to the beginning, not simply chronologically, but also existentially. He returns--as he so often does throughout the Gospels--to his relationship with the Father. Yesterday, found Jesus at the place of his baptism. Today, as the people plan to kill Jesus, Jesus returns to the desert. Baptism, desert, Cross. It seems that this final tour of Jesus' earthly life finds him returning to the places where his filial relationship with the Father were most strongly confirmed. Everything is being taken from Jesus. His ability to teach and heal is being curtailed. His reputation, destroyed. His support among the people, diminishing. His safety, in jeopardy. His friends, on the verge of betraying and abandoning him. In a sense, Jesus' Cross has already begun. Already, the sacrifice has begun. The last drop of blood will complete the sacrifice, but already he is being poured out like a libation. Jesus teaches us something in his pre-Holy Week liturgical tour. He returns to the place where his sonship was publicly confirmed by the Father and to the place where he fought the Devil who tried to undermine that filial relationship. In doing this, Jesus teaches us how we are to embrace the Cross in our own life. The opening antiphons for the Liturgies this week reveal the depth of Christ's agony. Today's, for instance, reads: "O Lord, do not stay afar off; my strength, make haste to help me! For I am a worm and no man, scorned by everyone, despised by the people." In the depth of his agony, only just begun, Jesus returns to the only thing he has that is dependable and certain: his sonship. Proclaimed at the baptism and affirmed in the desert, the sonship of Christ is sufficient to endure all things. The Christian disciple follows Christ to the Cross. As we approach, we perhaps search in vain for something upon which to depend; something to steady us. We cannot rely upon the passing things of this world no matter how good they might be. Jesus healed. Jesus forgave. Jesus treated each human person with dignity and respect. And now, what does he receive? He is beaten, betrayed, scourged, mocked, spat upon, humiliated, and condemned. This is the path for his disciples. How are we to endure such treatment? How are we to walk upon this path? Jesus shows us. We are to walk this path as sons and daughters of the Father. Physical strength will depart from us. Exterior supports will disappear. Reputation will fade. And, sometimes our moral strength will fail. What remains is God's fidelity to us. We are chosen to be his sons and daughters not because of our success, not because of our own moral rectitude, not because of our good standing in the community, and not because of our human talents. We are chosen because God has ordained it such. When everything else is gone, we remain chosen by Him. In the days before the completion of his final agony, Jesus takes us to the place of baptism and to the place of temptation in order to strengthen us in our confidence in our Divine adoption. No matter what happens, no matter what lies ahead, no matter what we endure, we are chosen by Him. And, it is with the confidence of being chosen--adopted by God--that the Church can pray as it did in this morning's blessing over the people: "Do not allow, we pray, those you have redeemed by the Death of your Only Begotten Son, to be harmed by their sins or weighed down by their trials." As we enter more deeply into Passiontide and Holy Week, the readings build in their intensity. On today, the Friday of the Fifth Week of Lent, Jeremiah writes "I hear the whisperings of many, 'Terror on every side! Denounce him! Let us denounce him!'" The Gospel begins with the words of Jeremiah finding their full import as the crowds pick up rocks to stone Jesus. The rejection that Christ experienced must have been intensely painful, especially when it came from his own people. Jeremiah says, "All those who were my friends are on the watch for any misstep of mine." The rejection that Christ experiences must pierce more deeply than any of his physical wounds. As Lent progresses, Christ's mission seems to be more and more a failure. Everywhere, he is rejected. We hear these magnificent accounts of the man born blind, the woman at the well, Lazarus, and the woman caught in adultery, and they are indeed beautiful. But, from a numbers perspective, they are the few. The crowds who are rejecting Jesus far outnumber the few. Jesus must feel this in his soul. It is not simply a matter of them rejecting him. No, they are seeking to destroy him. It always hurts us when we say something that is true and somebody doesn't believe us. It would be all the worse if, when we speak the truth, someone would denounce as a liar. Imagine, Christ is the Truth and is denounced as a liar. This must hurt him greatly. Jeremiah's description of this trial makes the hatred and rejection almost tangible. And as the intensity of hatred and rejection build to fever pitch, there is all of a sudden a moment of lightness. "But, the Lord is with me," says Jeremiah, and just like that, things change. The Lord's closeness makes everything different. At the end of the Gospel today, St. John tells us something that seems unimportant (and I'm not scripture scholar), but that I think is very significant. He writes that Jesus "went back across the Jordan to the place where John first baptized, and there he remained." Why does John tell us this? I think it is so we would do likewise. All of us who are Christians occasionally will experience rejection, denunciation, abandonment, and the appearance of failure. Like Jeremiah, we want to remember that "the Lord is with me." Perhaps, the reason that Jesus went back across the Jordan to where John baptized is because that was the place where Jesus was baptized too. All of us, who experience temptation, rejection, denunciation, and failure should go back to the place where we became God's son or daughter. When Jesus was baptized, God announced, "This is my Son." When we were baptized, we too became children of God. In that moment, we could say, "The Lord is with me." Jesus perhaps returns to the place of baptism to remind us that when we experience the Cross, we need to have confidence in God's nearness to us. If we were to be rejected by the whole world--even our friends--we would still be chosen by God. Lent is about preparing catechumens for baptism and about preparing the baptized for greater fidelity. Perhaps Jesus returned to the place of his baptism to teach us. The Way of the Cross may be marked by terror on every side, the whisperings of many, false accusations, violence, and rejection. If the Christian disciple is to walk this road with Christ and experience the intensity of the rejection, he must first go back across the Jordan and remember his baptism and have confidence in the grace of his baptism. No matter if the whole world rejects me, on the day of my baptism, God said, "You are my son." "The Lord is with me." God has chosen me. With this knowledge, I can embrace the Cross. As we approach Good Friday, let us make a brief pilgrimage with Jesus back across the Jordan to the place of our baptism and remember he has chosen you and you are his child. In large part, when I've considered the Cross in my own life, I've thought mostly about those things in my life that are imperfect, sinful, and displeasing to God and must be put to death. But, this Lent has been less about that type of dying and more about participating in the Cross in a new way. When Christ stood before Pilate and was condemned, when he was beaten, stripped, and humiliated, and when he poured out his blood on Golgotha, he gave what was good. Christ who knew no sin, became sin. This was the ultimate injustice. As Christians, we are all called to die to sin and to experience the pain that comes with such a death. But, Christianity isn't just about self-improvement. When we are called to surrender our sinfulness, we can make sense of that. But, Christian discipleship often requires that we surrender and sacrifice good things. And those sacrifices can make absolutely no sense at times. And, those sacrifices might never--in this life--be returned. They might remain an absurdity and we might never be given the opportunity to look back and say, "Oh, now that sacrifice makes perfect sense." Part of the sacrifice may well be enduring the absurdity of it. In the past eight years or so, seven men associated with this parish will have either been ordained to the priesthood or will have entered the seminary. Their connection with the parish varies. Some were received into the Catholic Church through our RCIA, some were lifelong parishioners, and some found their way here for some reason or another. No matter what, to have seven priestly vocations associated with one parish in such a short period of time is not common. And yes, it is something in which I've taken a lot of pride. Additionally, I've been happy that our parish has become a home to so many seminarians along the way. Now, I have to sacrifice that. Some say, "Oh, you will do that again in a new parish." Maybe. But, it is entirely possible (likely?) that the door now closes on that special grace that God had given in this particular place and time. Maybe this parish will continue to flourish with vocations. Maybe it won't. Maybe my next parish will flourish with vocations. Maybe it won't. What I know is that the life shared by this particular priest with these particular parishioners in this particular time and in this particular place was a fruitful seedbed for vocations. Maybe I will someday look back and joyfully comprehend the hidden wisdom in all of this. Then again, I may never comprehend its wisdom, and it may even prove in the long run to be lacking in wisdom. Who knows how it will all play out? Therein lies the sacrifice. Beyond the external sacrifices--and far more wounding to the soul--are the internal sacrifices. When we walk the Via Crucis, like Christ's image left upon the veil of Veronica, we leave something of ourselves behind. If all we left upon the Way of the Cross were our sins, then there would be little merit in that. We sometimes are called to leave behind our own image--our good name, our reputation, and our confidence in earthly standards. Veronica's Veil may irrevocably take from us things that had, up to this very moment, been at the service of the Gospel. At the Cross, we leave not only our sins, but everything. Walking the Way of the Cross with Christ may produce immediate fruits in our life; fruits that make things comprehensible. Perhaps it makes us more sensitive to the sufferings of others, more credible in preaching forgiveness, better able to relate to the spouse who feels betrayed, and better able to guide others in their own Via Crucis. Then again, maybe none of this will occur. Part of the suffering that the Cross entails is--at times--its total incomprehensibility. It was only in the very last moments of Jesus' agony that the good thief came to repentance. And, it was only after Jesus breathed his last that the soldier came to faith. Some sacrifices, difficult though they may be, are nonetheless comprehensible in their logic and in their results. There are other sufferings that are notable for their lack of justice or for their lack of rationale. In these latter instances, deprived of even the satisfaction of seeing the greater good, all we are left with is Christ. We are left knowing (as almost every Catholic church in the world has hanging along its walls) that Christ walks this way with us and before us. Unlike the rest of us who bring to the Cross some mixture of good and evil, he only brought to Calvary good things. Only his love makes his sufferings comprehensible. In the face of the Cross, sometimes we seek to comprehend the logic of suffering. But, such logic is often lacking. At other times, we are inundated with trite spiritual platitudes. Such platitudes tend to reduce the reality of things. In the end, the only thing that makes the Cross comprehensible is love. The logic of love doesn't explain away the absurdity of the Cross. It swallows it up and defeats it. The New Evangelization faces external obstacles such as secularism, atheism, and just plain indifference. But, it also faces internal opposition. Almost every day, I check out various Catholic blogs that represent two ends of the ideological spectrum. One of those blogs daily bemoans the fact that the Catholic Church is still . . . well . . . Catholic. The other one bemoans the fact that the Catholic Church is no longer Catholic. Neither of these, however, is the greatest threat to the New Evangelization. Conservative and liberal ideologies certainly attempt to hijack the gospel for their own purposes, but these won't amount to much. The greatest threat is not from the extremes, but from the middle. Approaching the gospel as "coming from the middle," is still to think of the gospel in an ideological way. The "middle" is just a third ideology that exists between the two extremes. But, in this instance, the virtue is not found in between the extremes. When it comes to the gospel, the virtue is found in its full, unhindered, zealous proclamation. The gospel is not located on an ideological spectrum. Unfortunately, so many who have been entrusted with the gospel feel as though the right thing to do is to live in the middle. It's a way of governing and exercising pastoral care that doesn't consider the good of souls, but rather the good of appearance. The New Evangelization, if it is to be effective, needs to be unchained from the prison of the "middle." But, there are those who have been lifelong adherents to the "middle theory," and it is difficult to break their stranglehold on the New Evangelization. One can see why in the Book of Revelation, Jesus condemns the lukewarm and says, "How I wish you were either hot or cold." At least the extremes have a fire in the belly. The middle is always about trying to make Catholicism saccharine and nondescript. The middle ideology is the, "let's make Christianity bland" approach. It fears the new movements in the Church because those seem to have too particular a vision and are not bland enough. It fears the "new peoples," because they are too different and their devotional life seems too old fashioned. It fears evangelical preaching because it sounds too decisive. To the middle ideology, everything is "too" something. Recently, George Weigel wrote a book (which I've been reading) entitled, "Evangelical Catholicism." In the book, Weigel speaks at length about what is happening in the Church and how this "Evangelical Catholicism" is the path of the future. Thus far, however, (I'm only halfway through the book) Weigel has not addressed the reality that this Evangelical Catholicism is going to meet with tremendous opposition from the proponents of a middle of the road, lukewarm, nondescript Catholicism. To them, the New Evangelization is not primarily about a renewed, joyful, and forceful preaching of the person of Jesus Christ and friendship with him. No, for them, the New Evangelization is often about having greeters at the entrance to the church and making sure that the bulletin tells new arrivals where the bathroom in the church is located. Are those things helpful? Sure, but the middle tends to make these things central. In going after the middle ideology here, I am not endorsing the conservative or liberal ideologies either. They are all the wrong starting point for the New Evangelization. The New Evangelization has to be about Jesus Christ. Jesus Christ who told Matthew to get up and follow him. Jesus Christ who told the rich young man to go and sell everything, give it to the poor, and follow him. Jesus Christ who suffered and died for our sins and who rose from the dead. The New Evangelization is about friendship with that Jesus Christ, a friendship that is engaging, demanding, and joyful. We always think of ideologies as being from the left and from the right. But, this middle ideology is like a sleeper cell in the life of the Church because it appears to be in the place where we often think that virtue lives--in the middle. But, this middle is a prison for the Gospel. I'm willing to bet that the parishes that are dying off the fastest are those who pride themselves on being in this middle. In the middle, the goal is to make everyone comfortable. Eventually, people figure out that they don't need to go to church to feel comfortable. They can stay at home and be comfortable. Those who live out of the ideology on the right want to freeze the Church back in the 1940's. Those on the left want to lead the Church right out of Christianity. But, I think it is this middle that is the most dangerous. This ideology would have had no room for an Ignatius, a Catherine of Sienna, or a St. Francis of Assisi. They would have all been far too radical for bland Catholicism. It isn't just about the demands of Christianity that the middle finds unappealing. Anything that seems too lofty or beautiful gets jettisoned too. It is easy to define the right and the left as ideologies, but very few would ever admit that the middle is also an ideology. And, a great many people who exercise power in the life of the Church probably find themselves in the middle. The middle is the place where the New Evangelization will meet its strongest opposition. While the left and the right would likely slay their opponents outright, the middle doesn't work that way. The middle will simply attempt to suffocate the New Evangelization. Unlike the ideologues on the left and the right who usually arrive scowling and dressed for battle, the ideologues in the middle usually show up smiling and dressed in neutral colors. In their mind, they are not ideologues. They think of themselves as the anti-ideologues. But, as long as they are dwelling on that plain, they are ideologues. The New Evangelization is about extricating us from that "conservative, middle, liberal" plain so that we can announce the Gospel in all of its beauty and magnificence. But, as great as I think the New Evangelization is, I think opposition to it is going to be fierce. Christianity is always a radical choice. The last thing the middle wants is for anybody to be faced with a radical choice. That is just . . . too . . . radical. The middle wants Christianity to be nondescript and bland. I think that they are probably all good people who really think that they are performing a great service when they kill with kindness. In large part, in many dioceses, parishes, and institutions, the proponents of the bland, nondescript, lukewarm Catholicism wield a lot of power. So, large scale victory for the New Evangelization is unlikely in the short-term. The agents of the New Evangelization will have to focus their energies on smaller communities and on one on one evangelization. This method may seem underwhelming and disappointing to those who are afire with the desire to evangelize, but this is how it began with the apostles. For today, we might have to give up on the dreams of widespread New Evangelization successes and instead settle for individual conversions and small pockets of victory. Parish priesthood is lived among the people. On the night before St. Patrick's, I gathered with one of my parish families for an Irish sing-a-long. There was probably an attendance of about 75 folks singing rebel songs for quite some time. Priest and people. It's a beautiful thing. During the 10:30 Mass this morning (another priest had the Mass), I snuck up to the choir loft to snap a picture of the crowd below. Present at Mass were members of the Knights of Columbus who have busily been establishing a council in the parish, members of the high school youth group who are preparing for a trip to Rome and for a service project for the homeless, and a great group of RCIA catechumens and candidates who are preparing for baptism, confirmation, and/or reception into full communion with the Catholic Church. I looked down at that crowd and was very pleased. Priest and people. It's a beautiful thing. After the morning Masses, I went to the home of a family in the parish and the husband and father of the family, who is from Ireland cooked a full Irish breakfast for us all. I baptized his youngest son in an emergency just about one year ago. The young boy was the center of attention and is really coming along. It was great to sit at their table, share stories, and have a lot of laughs. Priest and people. It's a beautiful thing. Later in the afternoon, I had the great privilege to baptize an infant named Elijah Thomas. Great name! His family lived here until a year or two ago when the father's job took them elsewhere. We do not know each other all that well, but I've baptized their other children and am always just so happy to see them. 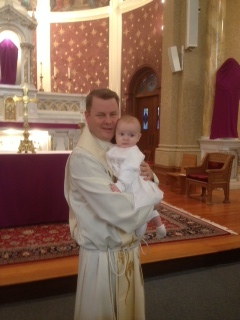 I was delighted when they called and sought to come back for this newest baby's baptism. It's a funny thing, but although I only know them a little bit, whenever I see them, I am filled with happiness for them. I'm proud of how well they are doing as a family. They're raising good kids. Priest and people. It's a beautiful thing. And then tonight, St. Patrick's Day, it was off to a parish family's home for a delicious boiled dinner. I've sat at their dinner table more times than I could ever count. At the table were the two parents, seven kids, two grandmothers, and me. The oldest boy who is graduating high school looks down at me now when he speaks to me. I gave him his first communion when he was in second grade. Somewhere along the way, they welcomed me into their family. Priest and people. It's a beautiful thing. Parishes are priests and people. And that is a beautiful thing. By all fair accounting, the woman in today's gospel was having a bad day. Not only did she commit adultery, but she was also caught and had now become a public spectacle. If anything qualifies as a bad day, this would seem to be it. Whenever I read this gospel, I am struck by how she is treated as a result of her sin. She becomes a case study. The crowd doesn't speak to her, but rather about her. It is as though she did not exist as her accusers speak to Jesus about her. She becomes entirely identified with her past and her future is about to be eliminated by execution. But, the very cause of her downfall becomes the meeting point with her redemption. Sin separates us from God, but God in his infinite love, takes the "stuff" of sin and uses it to bring us closer to him. He does not allow sin to be the last word on our existence. For the Pharisees in today's Gospel, sin pretty much ended the story on that woman's life. Even though she was still alive, the very fact that she was now treated as an object of discussion rather than a person to be addressed gives this sense that the last page on her life was already written and she may well already be dead. We too can act this way at times. Whether it be about our own sins or the sins of others, we can allow past sins to be the final word on our existence. So often, people carry within themselves the memory of some past sin which they are unable or unwilling to bring to Jesus. Perhaps, they do not think of this sin often or maybe they think of it daily. But, whenever it comes to mind, it deprives them of their future. It returns them to that moment when they became separated from God. No matter whether they have moved on in life to do great things, they are still haunted by this unresolved sin in their life. As such, the sin exercises an enormous power over them. It deprives them of their future. In today's Gospel, Jesus saved that woman's future. Not simply in saving her from being stoned, but in addressing her. He was the only one in the Gospel who spoke to her and not just about her. She encountered the mercy of God in the person of Jesus Christ. In an amazing turn of events, because she was a sinner in need of mercy, she encountered Jesus. Her sin became the place of an encounter with Christ. No, her sin is not what God wanted for her. But, God did not deprive her of a future because of her sin. Instead, in God's beautiful mercy, he took what should have been the end of her story and transformed it into the great new beginning. Sometimes, people wonder what the priest thinks when people come to confession. Let me tell you that there is nothing better than to witness (and be an instrument of) somebody being set free from the tyranny of some past sin. In the matter of seconds, the ridiculous power that this sin has exercised over this person, for who knows how long, is broken. Perhaps for years, there was a persistent whisper in this person's life, "You have no future. You can go through the motions of trying to live a good life, but your life ended on the day you committed that sin." But, in a moment of pure awesomeness, that person meets Jesus in the Sacrament of Penance and is set free. What does the priest think? Does he sit in judgment of the person who has sinned? Let me put it this way: On Easter Sunday, when the apostles saw Christ, do you think that they were more amazed that he suffered and died or that he had risen from the dead? They would see his death only in terms of the resurrection. Similarly, in a confessional, the priest (and hopefully the penitent!) can only rejoice that this person's future has now been restored. They were dead, but are now alive. To encounter Christ is everything. Without him, we are doomed by our past. But, in his presence, we are restored to our future destiny. There is a corollary to all of this. Many who experience the great mercy of God and who have their personhood and their future restored by him, may find themselves occasionally subjected to the manipulations of the Devil. Even though he lost the battle to keep the sinner imprisoned in the past, he desperately attempts to restore the prisoner to his or her cell. How does he do that? Oh, perhaps it comes in the middle of the night. The doubts about God's mercy return. The memory of the sin can attempt to drag us back to the place where our humanity and our future was lost. But, we should not fear. In those moments, all one needs to do is to live the encounter with Christ. Christ addresses us in the present. The Devil addresses us, so it seems, always in the past or in casting doubt upon the future. Jesus meets us here and now. Today, and in the remaining weeks of Lent, our churches will be filled with persons who are haunted by some thing of the past. Maybe like the woman in today's Gospel, their sins are publicly known and their accusers are around them. For others, their sin is carried unknown to the world and it is only their own conscience and the Devil who accuse them. To them all, I would say that Jesus can set you free. He will restore your personhood and your future. He will address you and no longer make you feel like your life is summed up in one long ago fact. He wants your life to be defined not by your failures but by his friendship. What Jesus did for the woman caught in adultery, he wants to do for all of us. Our past sins need not steal our futures from us. In the encounter with Christ, all things are restored and made new. In the encounter with Christ, we discover true freedom and are made able to walk with joy toward our destiny. When a man who is preparing for ordination to the priesthood is first ordained as a deacon, he promises to live in lifelong celibacy for the sake of the Kingdom of Heaven. Additionally, he promises respect and obedience to the bishop and to his successors. In exchange, the bishop hands the ordinand the Book of the Gospels and instructs him to believe, teach, and follow the Gospel. Similarly, in the Rite of Priestly Ordination, the man once again renews his promise of respect and obedience and, in turn, the bishop presents him with a chalice and a paten for the offering of the Holy Sacrifice for God's holy people. There are other things that a priest ought to be able to expect from his diocese: a living wage, respect, proper healthcare, a place to live etc. But, none of those are given during the Rite of Ordination. There is no point in the ceremony where one works out the details going forward. There is no pre-nuptial agreement, so to speak. He is entrusted only with the Gospel and with the chalice and paten. He is to conform his life to that which has been placed into his hands. Through the Gospel, he is to become united to the Word made flesh and through the offering of the Sacrifice of Calvary, he is to become increasingly united to Christ crucified. Ultimately, all the priest has is Jesus in his Word and in his Body and Blood. When I prepare couples for marriage, I sometimes will review the vows with them. One option for the vows says, "I will love you and honor you all the days of my life." Wow. We often think of the vows simply meaning that neither person will commit outright adultery. But, the vow says, "I will love you and honor you all the days of my life." That's a tall order! "I will love you and honor you when you're moody, when you're lazy, when you're selfish, when you're obstinate, when you're unfaithful, when you're obtuse, etc. No matter what, I will love you and honor you." It would seem that there is an awful lot of room here for the possibility of daily failures in regards to this vow! So too with the priest. There may not be dramatic "breaking of the vows" moments in his life, but there are those day to day infidelities that have to be considered honestly: Moments when he failed to receive the Gospel fully into his heart and to preach it with zeal, love, and integrity; moments when he has not totally conformed his life to the Mystery of the Cross that he offers daily upon the altar; moments when he has not become perfectly united to Christ, the Priest and Victim; moments when he has failed to feed, lead, or protect the flock entrusted to his care. Every priest will likely come face to face occasionally with the fact that his diocese is imperfect. By God's grace, this experience of the imperfection of his spouse will allow the priest to recognize his own imperfections and infidelities and encourage him to greater fidelity to the Mysteries that have been placed into his hands. The imperfection that he discovers in his spouse may be God's way of helping him see his own imperfection. Ultimately, whether we be married, single, priest, or religious, we cannot base our own fidelity or perfection upon the fidelity and perfection of others. Otherwise, we will always be less than what we are called to be. The fidelity and love that each of us is called to must have Christ as our only measure. Were the Ordination Rite to include a healthcare package, a signing bonus, a retirement package, a guaranteed assurance of respect etc, the priest might be tempted to reciprocate his own love based upon those standards. Instead, he is given the Gospel and the offerings for the Eucharistic Sacrifice. Through these gifts--entrusted to him by the hands of the bishop--the priest is called to make Christ, the Shepherd and Bridegroom, present in the midst of the flock. He is called to manifest through his own way of life, the true charity made possible only in Christ, a love that lays down his whole life and a love that loves to the very end. A Humble Pope Is Teaching: Are We Listening? Humility is a word that is being used a lot these days. In the days preceding the papal conclave, if you live in Boston, you heard a lot about Cardinal Sean O'Malley and his humility. In the twenty-four hours after the conclave, we have heard a lot about Pope Francis' humility. It's kind of a difficult thing to figure out because if your humility all of a sudden gives you celebrity status and everyone is talking about how humble you are, it starts to feel to me like it is a little . . . well . . . not so humble. So, for instance, whenever a newspaper columnist is trying to talk about Cardinal Sean's humility, they inevitably say something like, "Eschewing the ornate cardinatial attire, Cardinal Sean humbly wears a simple brown habit and sandals." From this, the reader is apparently supposed to conclude that all of the cardinals who wear red must not be as humble. But, and I think Cardinal Sean would be the first to agree, there are many priests who wear sandals who are filled with pride and many priests who wear shoes who are very humble. Similarly, the media is making a big deal out of the fact that Pope Francis went to his hotel this morning to pay his bill. (And, I like that story too!) They are all saying this shows how humble he is. But, the very fact that it attracted so much media attention complicates things. In other words, how can public acts of humility still be considered humble if they attract so much attention and accolades? I ask these questions not because I doubt their humility, but to understand how this all works. And, I think it has something to do with the nature of public persons and the importance of symbols. For instance, Jesus probably suffered many humiliations in silence in his life, but at some point, he washed the feet of the twelve apostles. In a sense, Jesus publicly "showed off" his humility. He did something publicly that symbolized his interior humility. He did this in order to teach a lesson. "What I have done, so must you do." That quasi public act of humility was recorded in the Gospel of St. John and is repeated at the Holy Thursday Mass each year. The liturgy considers it important for the people (and the priest) to see the priest publicly performing an act of humility. It doesn't make the action less humble because it is performed publicly. But, the public nature of the act is really intended to remind everyone of the interior necessity of imitating Christ in his humility. Similarly, I'm not particularly interested in the pope paying his bill at the hotel or Cardinal Sean's choice of wardrobe. I'm only interested in the lesson that those things intend to teach us about the Christian life. Presumably, neither the Cardinal nor the Pope do those things so that everyone can talk about how humble they are! But, they nonetheless do them. As teachers, they need to teach not only in word, but also in deed. And so, those public moments of humility are really intended as signs pointing to something beyond their own personal humility. If the terminating point in these acts was for people to say, "Gee, isn't he humble," then that would really be a spiritual disaster! Instead, the terminating point in these acts is the person of Christ and his Gospel. These acts of humility are intended to bring people closer to the Gospel by removing any potential obstacles. Those public acts of humility that are seen by all are really just small indicators of something that is far more profound and interior. I've seen public acts of humility that simply reveal the beauty of what true humility is. For instance, Pope Benedict XVI's resignation. Yes, Pope Benedict wore fancy liturgical vestments and was the POPE! One month ago, he decided to go and spend the rest of his life in quiet prayer for the sake of the Church. That's humility! Cardinal Sean's brown robe really doesn't mean much to me. But, if you are ever at a gathering with Cardinal Sean, you can't help but notice that he often fades into the background. He's not the center of attention and is happy to have it that way. That's humility. One of the things that I like about Pope Francis' election is that nobody was really talking about him before it all began. I like that he was from Argentina and has spent his whole life there. As little bits of background begin to come out about him, there is one story that I am particularly curious about. Apparently, he was the provincial of the Jesuits for a period of time and, much to the dismay of many under his authority, he led the Jesuits in a manner faithful to the Church and didn't allow the community to go astray. At the end of his faithful service as provincial, they banished him to a small high school to teach chemistry! I'd like to know more about that experience in his life. What was in his soul at that moment? I imagine it was an opportunity to grow in true humility. Fidelity to the Christ is its own reward. Oftentimes, when people talk about Cardinal Sean's robes or Pope Francis cooking his own meals, they do so as a way of saying, "Cardinals, Popes, and priests should be more humble." Fair enough. We should be. But, so often they say this in a very prideful way. Those who often talk about these things do so as if they were spiritual masters who are up to the task of telling everyone else how humble they should be. On the contrary, Pope Francis, Cardinal Sean, and many other humble people don't go around telling others that they should start being more humble. Instead, the Pope, the Cardinal, and others follow the path of the one who is truly humble, the one who took on the form of a slave, was born in the likeness of men, and who humbled himself to die on a cross. They teach others to be humble by just being humble. When the Pope or the Cardinal performs some public act of humility, it is not so others will say, "Look how humble he is." And, it is not so that hypocrites can go around pointing the finger at some perceived lack of humility present in others. Instead, these public acts of humility--which arise from a profound interior humility--are a . . . humble . . . reminder to ALL OF US of Christ's command: "What I have done for you, so you must do." This morning, as I was walking into Mass, I gave a quick wave to a policeman who was up the road a bit. He held up his finger asking me to wait a minute and he hurried down and met me outside the church. We shook hands and he asked, "Father, is it true that you're leaving?" "Yeah, it is," I replied. "Well," said he, "I'm really disappointed to hear that and I'm really going to miss you." He's not a parishioner of mine, but over the years I've come to know and have a good relationship with the police in town. That small interaction not only made my day, but it also provided something that can sometimes be lacking in ecclesial structures: humanity. His taking the time to walk down the road a bit, shake my hand, and to exchange some recognition that the present situation is disappointing was the human thing to do. What came naturally to this policeman is often lost in the bureaucracy of ecclesial life. And, even when such things are present in bureaucracies, they can tend to be inhuman in the execution. A guy hurrying up the street to seize an opportunity to express the human realities of a situation is more consoling than something that feels like it was decided at a conference table. We should be cautious in the implementation of the new pastoral plan that the personal and the human are not lost in the graphs and in the statistics. Pastoral planning is more about the priest and the cop standing on the side of the road than it is about the chart on the wall. The pastoral plan will likely succeed or fail based upon how well it treats the humanity of those involved. A handshake and a kind word today made me more committed and dedicated to that guy and his fellow police officers. The interaction lasted all of two minutes, but it was human. The mission of the Church, in part, is to show others how life in Christ makes us more fully human. If the implementation of the pastoral plan is to be successful, it needs to be about the human person. And such a full humanity is not something that can be plotted out in a ten point plan. That type of humanity arises out of an encounter with Jesus Christ and it either permeates everything about our life or it doesn't. The New Evangelization is about the new life--the new humanity--that is available in Christ. People standing on the street--if they are to come into the Church--have to be shown that a greater humanity is available in the Church than what they can find elsewhere. If they discover that our humanity is lacking, shallow, or hollow, they'll stick with the humanity they can find out on the street. If you walked into my church a couple of Sundays ago, you would have heard the choir singing Palestrina and on most Sundays, you likely would hear some type of chant. I know this might make some of my musician friends cringe and think I've gone nuts, but almost every day, I listen to Christian Rock, usually while shaving in the morning. This morning a song came on that I had not heard before. It came as a word of encouragement for me. I found a version of it here http://www.godtube.com/watch/?v=09B911NU. For those who can't stand Christian Rock, don't bother listening. But, I found it a consoling word. The song is by a group called Sanctus Real. The name of the song is, "Promises." Even when all things have been unleashed against us, we can have confidence that we shall still conquer because nothing that is thrown at us can separate us from the love of God. We will conquer and be victorious. That's a promise worth holding onto. Sometimes, the scriptures leave certain things to our imagination. For instance, although we know that the Holy Family fled to Egypt, the details of any particular hardships are left unspoken. We kind of have to fill in the blanks. But, there are other times in the scriptures where the details are provided, like in the Book of Exodus. The plagues, for instance, are described in detail. God speaks to Moses. Moses goes and speaks to Pharaoh. Pharaoh is obstinate. Then a plague comes. Then, God speaks to Moses . . . and so on. Then, as we all know, the great Exodus occurs; a moment of true magnificence. The power and the glory of God are made manifest on that day by the Red Sea. The Hebrew people are out of their minds in their rejoicing. God has saved them. He is truly awesome. Then, they get hungry and start complaining and grumbling. I like that whole part about the people getting hungry and complaining. "Yeah, okay so God just helped us defeat this powerful army and released us from slavery. And he did it by parting a sea so that we could pass through it and then used that same sea to crush our oppressors. But, what's for dinner?" I like it because I relate to it. I'd be one of the grumblers. And, if I were Moses, I'd be thinking, "God, why did you do this to me? Why make things so successful only to let the whole thing end now? I mean really. We are going to go down in history as a people who pulled off the greatest escape ever only to have forgotten to bring enough food with us to survive?" These days, as I look back at the course of my time in this assignment, I cannot help but feel a bit of elation at the tremendous deeds that God has wrought among us. By that, I do not mean that I have been without my faults and failings. Rather, I mean that even despite all of my faults and failings, God just continued to do tremendous things here. I feel like everything we did somehow turned to gold. But, in an instant, as I stand on the other side of the sea and look back, I wonder, "Okay, now what?" It never occurred to me to pack lunch. I was busy getting caught up in the awesome events that were unfolding to ever plan for the future. I didn't take out an insurance policy before I left. I didn't line up a job for the post-exodus. Didn't make any phone calls to call in favors. I didn't even think to bring some trail mix to hold me over for a while. In the words of Homer Simpson, "D'oh." In a couple of weeks, I will have the great privilege of hearing the Exodus account shortly before baptizing three people into the Faith at the Easter Vigil. Exodus, of course, is the great foreshadowing of the gift of Baptism when a person passes through the waters of death and emerges as a new creation on the other side. Baptism is an extraordinary event, to die and rise with Christ. But, I find it particularly beautiful and instructive that the rubrics for the Easter Vigil allow the priest before he says, "Behold, the Lamb of God," to instruct the newly baptized (and newly received and confirmed) that their first communion--which they are about to receive--is the climax of initiation and the center of every Christian life. While Exodus was a magnificent manifestation of God's supreme power, in a sense, this extraordinary moment led to something far more profound and sublime. The great Exodus set the Hebrew people free, but it set them free so that they could live in a greater intimacy with God. And, this greater intimacy was manifested not so much in mighty deeds, but in the daily reception of the manna. For forty years, they were daily fed by the hand of God. This intimacy was why they were set free in the first place. No matter the awesome deeds that God works in and through our life, they ultimately lead to the Eucharist, the daily bread that comes down from heaven. The mighty works provide to us a gateway to faith, but faith is ultimately sustained and nourished by the sublime and spotless Victim who daily is offered sacramentally in the Mass. There, Christ places upon our tongues the food that is himself. We become one with him. I am grateful for all of the mighty deeds that God has worked in our midst. They have been powerful and splendid reminders that He is an awesome God and we are His people. But, here on the other side of the sea, we have no need to fear or to wish for a return to where we once were. The circumstances might be adverse, the land unwelcoming, the planning faulty, and the provisions low. Our faith is not based on the acceptability of the circumstances or on our ingenuity. Instead, our Faith is based on the one who feeds us no matter the circumstances. All of us--like those being baptized at Easter--are pilgrims making our way in Faith. No matter whether we experience victories or seeming defeats, joys or sorrows, or praises or humiliations, the One who loves us will renew that love once again today and tomorrow in the Sacred Banquet wherein sublimely "Christ is received, the memory of the passion is renewed, the mind is filled with grace, and a pledge of future glory is given. Amen." Colloquy. O, my God, I will put myself without reserve into Thy hands. Wealth or woe, joy or sorrow, friends or bereavement, honour or humiliation, good report or ill report, comfort or discomfort, Thy presence or the hiding of Thy countenance, all is good if it comes from Thee. Thou art wisdom and Thou art love--what can I desire more? Thou hast led me in Thy counsel, and with glory hast Thou received me. What have I in heaven, and apart from Thee what want I upon earth? My flesh and my heart faileth: but God is the God of my heart, and my portion for ever. One evening, while at dinner at the home of some parishioners, one of the seminarians from my parish recounted a humorous story. The people were asking him how it is that he wound up in the seminary. He gave a detailed account of various moments in his life. And he added, "And then, of course, I started going to the early morning daily Mass at St. Mary's. Fr. Barnes would get in the pulpit and say things like, 'If you think God is calling you to the priesthood, say 'Yes.'" Then the seminarian adds dryly, "I would look around at the rest of the congregation and see that I was the only person there under 60 and I'd think, 'Gee, I wonder if he's talking to me?'" Subtlety is not my strong suit. He would have wound up in the seminary whether I was harassing him from the pulpit or not, but I hope my encouragement played some small role in his decision to enter the seminary. This came to mind because today God gave me a little gift. I was talking to a young man who out of the blue said to me, "I don't know if I will ever be a priest, but whenever you say at the end of Mass that perhaps God is calling some young man here today to the priesthood, I think maybe it could be me and I'm open to it. It's not like, 'never in a million years.'" This young man is a great, normal, fine person. I don't know if he'll ever be a priest, but it does my heart good to know that young men like him are at least open to the possibility. This young man's openness was a gift to me because it provided me with some needed assurance that fidelity to the New Evangelization is the way to go. There's a safe way to run a parish. It is to stay in shallow waters and trust in our own ingenuity. Adherents to this method seem to become increasingly entrenched the more that the method fails. The New Evangelization (in its true form), on the other hand, requires us to forgo the safety of the shallow waters and to risk everything on the Gospel and on the Holy Spirit. The New Evangelization may prove costly for those who embrace it, but it will lead to a strengthening of the Church. The lukewarm method may provide a comfortable existence to those who embrace it, but will most definitely continue to weaken the Church. Today's conversation encouraged me to keep rowing out into the deep waters. This weekend, a young man who was received into the Catholic Church a few years ago from this parish will be ordained a transitional deacon for the Dominican Order. What attracted him to the Church and ultimately to the Dominicans and to the priesthood was not some vague, fuzzy "spiritual" feeling. He loved Jesus crucified and risen from the dead and he loved the Sacraments. Probably for a little while longer, the shallow water method of fishing will win the day in the life of much of the Church. But, very soon and the ranks of priests will be dominated by those who are chomping at the bit to set out into the deep waters. I know this to be true because, in large part, priestly vocations are almost exclusively arising from those places that have already begun the New Evangelization. The New Evangelization will require apostolic zeal and fortitude and may be very costly. Not living the New Evangelization and playing it safe will and has exacted a far more serious cost. Leaving my assignment is a cross that I was fully ready to embrace, albeit with sorrow. But, I based my readiness on the presumption that when I received the call that I was being transferred, I was going to be told where I was being transferred. In that way, I could justify things to myself. I could say, "Well, you are being asked to sacrifice something good in order to go and serve these new people." But that is not how it occurred. Instead, the greater share of the cross has been in having one thing taken away but without the consolation of knowing that it was for the specific good of another place. I cannot, as I rehearsed for months(!) say, "Well, I am leaving here in order to go there." Instead, all I have is, "I'm leaving here." It is difficult in this moment to see how God's plan is being manifested. And, it would be too easy to make God's plan all neat and easy. I think we sometimes pass off to the mysterious workings of God things that might be simply the results of living in a fallen world. The things themselves might be far away from God's active will. It seems difficult to imagine that God wanted Joseph sold into slavery or for a man to be born blind or for a woman to commit adultery. And yet, he permitted all of these things to occur in order that his glory might be made manifest. In all of these examples, we see that the fallen world does not defeat God's plan. The Christian has to distinguish between God's active will and his permissive will. This means that we do not have to conclude that every suffering is directly and actively given to us from the hand of God. Instead, faith teaches us that God may permit us to endure particular sufferings so that we place our trust more in Him and less in the people and things of this world. Blindness, injustice, sin, and even death are not the definitive judgment on our life. Faith teaches us that these sufferings are not the final word on our existence. This is the hope that permeates the beatitudes. The Christian can be poor, hungry and thirsty, sorrowful, merciful, meek, pure, a peacemaker, and persecuted and have total confidence that what he suffers in those things will be as nothing compared to the reward awaiting him. Every Christian ultimately follows the Way of the Cross. This Way sometimes involves--like the Stations we pray during Lent--injustices, humiliations, falls, profound acts of simple mercy, darkness, and even a sense of finality. The Christian walks this Way, however, not as a trailblazer, but as a disciple. No matter where the Christian disciple goes, he discovers that Christ is already there to meet him, even into the tomb. And while we walk this Way, Christians do so with a beautiful consolation that even the tomb is robbed of its sting. There are many people in the world whose future is hidden from them and who have little clarity concerning what is God's plan for them. They are the unemployed, those awaiting the results of medical tests, the abandoned, and especially those who are suffering persecution and imprisonment for their Christian Faith. Be they in hospitals, home alone, or in prison cells, the temptation to despair must always be lurking about. There is little we can do for such people, but perhaps embracing and offering the cross of our own hidden futures is of some assistance to them. Two weeks ago, a parishioner sent the following to me and I have found it to be consoling. It is a helpful reminder that in the final analysis, we can only put our Faith in God alone and Faith is ultimately what it is all about. "God has created me to do Him some definite service. He has committed some work to me which He has not committed to another. I have my mission. I may never know it in this life, but I shall be told it in the next. I am a link in a chain, a bond of connection between persons.